For other reports on this project and the digitized GNT MSS of the British Library (which I think are now 74 MSS) , see here, here, here, here and here. 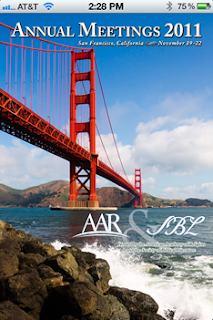 Made it home from SBL and San Francisco yesterday. Had some teaching today - supervisions which may have been a bit ragged around the edges (no lectures though fortunately). One of the (many) highlights of the trip was a visit (by bike) to the Muir Woods, an old-growth forest of Coastal Redwoods. I also heard (and gave) some presentations, ate some food, got some exercise, talked with some friends, bought some books and had a couple of misadventures. And thanks to a crowded flight and an unexpected upgrade I had quite a comfortable flight back to Heathrow. I am sitting in the lobby of Mariott Marquise, the enormous 30-floor hotel where I am staying at. I have just returned from a very nice ETC blogdinner with some twenty friends, where Peter Head, by the way, held a marvellous speech nearly as good as his presentation delivered earlier today. Peter had checked some blog statistics, and it turned out we had had over a million visitors. A funny remark about Peter's presentation and what followed. There had been some word exchange between the other presenters Jan Krans and Silvia Castelli concerning some issue in Peter's paper relating to Bengel and Wettstein. Wayne Kannaday then introduced Jan Krans's presentation, which immediately followed Pete's, as "The Folly of Peter Head," and then corrected himself, "The Folly of Conjecture? Baljon’s Novum Testamentum Graece of 1898." I will return with some more words about this year's SBL conference. Let me give you one piece of news: this week the new UBS committee has its first meeting here in San Fransisco. This is just a brief note that my book is now on display at the Eisenbrauns booth in the book exhibition – I didn't realize that they were waiting for the copies I brought with me, but now they are there (15 copies left). I will stop by at the booth on Monday 1 PM to chat and sign. I am of course also present on all the NTTC sessions. Now I am off to hear a couple of interesting papers on papyrology (several of them related to the New Testament). Just to confirm that I have been over to Sam's Grill and booked a table/room/set of booths will walls removed for 20 of us for Monday night starting at 7pm (Tommy and Pete W will hopefully be over once their meeting has finished). The address is 374 Bush Street, San Francisco (obviously). All are welcome (up to 20 anyway). Hopefully we shall have some semi-official reflections on the blog over the past year. ... (if anyone wants to offer such reflections let me know in the comments). So that is fourteen. If more than six people say they want to come (in the comments) I'll get back to Sam to see about a larger room. ‘Graham Stanton and the Four-Gospel Codex: Reconsidering the Manuscript Evidence’ Jesus, Matthew’s Gospel and Early Christianity: Studies in Memory of Graham N. Stanton (eds D.M. Gurtner; J. Willits, & R.A. Burridge, LNTS 435; London: T&T Clark, 2011), 93-101. Most of the other papers deal with Jesus, Matthew's Gospel and other aspects of early Christianity (surprisingly enough). For a link to the publisher (which may or may not have a table of contents) go here (hopefully they may be cheaper at SBL). Well done to the editors for getting this published in less than one year. Now back to work on the two papers for this year's SBL (still quite a few hours before the plane leaves). Handout now completed for my SBL paper, but the challenge remains as to whether received wisdom can be overturned ... I don't have much experience with flying a kite. The SBL Annual Meeting is approaching. I will pack my bag tomorrow. Jim Spinti of Eisenbrauns is running a special sale on my monograph, The Epistle of Jude: Its Text and Transmission and other titles in the Coniectanea Biblica series (OT/NT). My book now sells for $20 (list price $79), and eligible for an offer of free shipping to US addresses. You will be able to get a signed copy for this price at the Eisenbrauns booth at the SBL book exhibit. I will stop by some time (to be announced later in a blogpost) during the meeting and chat about Jude, New Testament textual criticism and other interesting things with whoever is there. In August I announced that a long-awaited tool from the INTF in Münster was soon to be published: Parallel Pericopes of the Synoptic Gospels edited by Holger Strutwolf and Klaus Wachtel in the Novum Testamentum Graecum, Editio Critica Maior series (NTGECM). The publication is the result of a research project designed to complement the test passage collations (Text- und Textwert) of the Synoptic Gospels, by which the influence of textual parallels on the formation of variants can be studied. It presents evidence of 159 MSS in 38 synoptic pericopes. Sample page here. 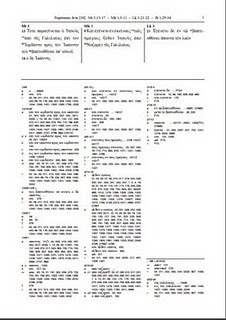 To enable computer-aided analyses of the material presented in Parallel Pericopies, the full critical apparatus comprising collations of 159 manuscripts is made available as a text file at http://intf.uni-muenster.de/PPApparatus/. If you follow that link you can download the full contents of the critical apparatus, but in contrast to the printed volume which displays most passages through a negative apparatus (cf. NA27), this database offers a full apparatus at each variant passage, which is very convenient if you want to do research. 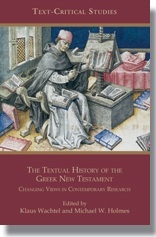 For example of such research, using this tool, see Klaus Wachtel's SBL paper from 2009 which is available online: "The Byzantine Text of the Gospels: Recension or Process." In the first column on the first line you see the digit "1," which stands for book 1 in the NT = Matthew; then "3" for chapter 3; "13" for verse 13; and "6" for the letter address "6" where the textual variant in question starts. Thus, here it refers to the third word in τότε (2) παραγίνεται (4) ὅ (6) Ἰησοῦς (8), i.e., the definite article. As in the printed publications in the ECM series, even numbers correspond to words in the printed text, odd numbers to the spaces in between, where we may find additions of words in MSS noted in the apparatus. The next column also has "6", i.e., this particular variant starts and end in 6 – it involves only the presence of the definite article. The next column, "a," means variant a (which is always the printed reading); variant b in this case stands for the omission of the article and it is attested only by 372 further down in the list. If "zz" appears in this column it signifies lacunae. (Incidentally, I think this data in the printed volumes in the ECM series including this one, should always be carefully verified against the corresponding appendices with list of lacunae, because there are some discrepancies between the two, and I think the appendix is more complete). The next column gives us the reading in unaccentuated Greek "o"=ὅ, i.e., the article is present in this witness. The next column refers to the witnesses. However, the first line, "A" indicates the reconstructed initial text (Ausgangstext), i.e., the printed text. The two last columns read "3" and "13" which means that the variant also ends in the same verse. There are also additional columns where data may appear, e.g., "f" which stands for Fehler and indicates that the editors have judged that a certain reading represents an error on the part of the scribe. In order to understand the database wholly, it is crucial to carefully read the introduction to this or any other volume in the ECM series in order to understand the presentation of the material and the apparatus according to the new and excellent ECM standard (which, by the way, I largely followed in my own work on an edition of Jude). On October 1, 2011 Dr. Bart D. Ehrman and CSNTM's Executive Director, Dr. Daniel B. Wallace, debated the reliability of the text of the New Testament at Southern Methodist University. This was the largest debate over the text of the New Testament in history. A professional film crew recorded the debate, which is now available to you. In this exciting dialogue you have the opportunity to listen to two leading scholars talk about this issue from opposing viewpoints. Can we trust the text of the New Testament? You decide. For my own thoughts on this debate, see here. It looks (to Tommy and myself) as if Monday evening should be the time for our annual ETC dinner at SBL (by far the majority of other receptions are on the weekend nights). In the programme there is an ECM session (P21-325; 4:00PM - 7:30PM), so it would probably be best to begin after that session I suppose (not sure whether the business part of that session is open or closed, but someone could tell us in the comments). But we are open to objections and alternative plans in the comments (for a few days anyway). Also ideas for places to eat would be welcome. The archival corollary to "Quis custodiet ipsos custodes?" would be "Who digitally copies the digital copies?" As we digitally images our manuscripts, we must ask how will we be maintain the digital images as they become more prolific than the originals? DVD images may become corrupt as soon as 20 years or may last considerably longer. The US Library of Congress has risen to task of copying their materials with robots. In the Time Magazine video below, the inventor of the system discusses his system which copies video media en masse.